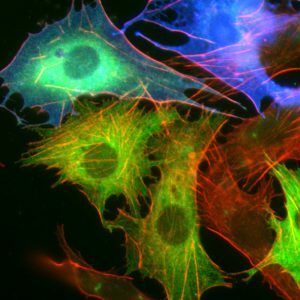 For more than three decades, our laboratory has been investigating the mechanisms by which normal cells are turned into cancer cells. Our specific focus has been on the role of growth factor receptors/receptor tyrosine kinases in this process. It is a truly translational research perspective, involving studies on the molecular mechanisms by which receptor tyrosine kinases signal during normal physiological conditions, over to studies on how oncogenic mutants of receptor tyrosine kinases contribute to the transformation of normal cells into cancer cells and the specific mechanisms by which these oncogenic versions signal. Taken together, those two fields of interest merge into projects that involve discovery of novel targets for therapy, investigation of novel therapeutic strategies etc. We have a general interest in various types of cancer, but at the moment we focus primarily on acute myeloid leukemia and malignant melanoma.